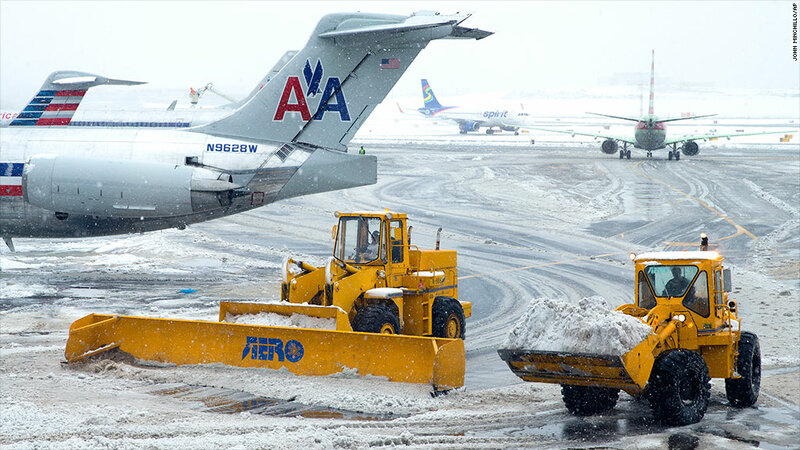 Airlines have had to cancel more than 100,000 flights so far this winter. The number of flights canceled or delayed since Dec. 1 has now topped 1 million, according to flight tracker masFlight. That's up 25% from last winter. There were 100,000 cancellations in the same period, up 100% from the same three months a year ago. MasFlight estimates that 7.8 million passengers have had a flight canceled since the start of December. The cost to them: Roughly $5.3 billion, due to lost productivity as well as extra meals and hotel stays. The expense to airlines caused by all this disruption has been considerably less: The industry has lost about $500 million. Most of that is due to revenue that's lost when fliers don't rebook their trip. Airlines also take a hit when passengers do rebook, because that limits the airline's ability to sell those seats to other passengers. The cost of dealing with bad weather is partly offset by what the airlines save on fuel and labor when a flight is canceled. Tulinda Larsen, vice president of masFlight, says that while the bad weather is much of the reason for the surge in flight trouble, there are new Federal Aviation Administration rules that are also a factor. These rules require more rest for pilots, and place limits on how long a plane can be parked on the tarmac before taking off. The regulations have forced airlines to cancel flights that they wouldn't have otherwise. "Without the rules we now have in place, the airlines had much more flexibility to reposition and reschedule flights," she said. The good news for airlines is that they were in much better financial shape heading into this winter than they have been than in past years. A rebound in passenger demand coupled with industry consolidation has fuel record profits for the industry. "They're financially stronger now than during previous winter storm periods," said Larsen. United Continental (UAL) warned last week that its results would be hurt by the 22,500 flights it's canceled. In January, JetBlue Airways (JBLU) warned that it would also post lower revenue and profits due to the storms.